More than 40,000 Ivorians have crossed into Liberia in early 2011 because of political instability in Ivory Coast. Some 25 people share a mud house in this village. CRS is building shelters for the Ivorian refugees and will also support host families. As the post-election clashes have again intensified in Côte d’Ivoire over the last weeks, hundreds of thousands of people have left their homes to flee a situation that could quickly turn into a civil war and a lasting humanitarian crisis. “There is a generalized fear within the population here that makes us think the situation could escalate,” said Jean Djoman, Director of Human Development at Caritas Côte d’Ivoire. The crisis in Côte d’Ivoire has been going on for four months since the outgoing president Laurent Gbagbo refused to hand over power to his rival Alassane Ouattara following to the 2010 general election. Mr. Ouattara has been recognised internationally as the winner of the poll but the two opposing camps continue to fight over the results. Around 500,000 Ivorians have already fled their homes to shelter elsewhere in the country or abroad, and at least 90,000 of them have taken refuge across the border in Liberia. Displaced people urgently need food, water, sanitation and protection. “We strongly hope that diplomatic efforts, in particular from the ECOWAS and the African Union, will be able to prevent the worst. Meanwhile, we are doing what we can to help the displaced,” said Mr. Djoman. “Caritas is present in nearly all of the over 20 sites where displaced people have mainly gathered and is providing food and other much-needed aid such as household items, hygiene articles and protection”, said Mr. Djoman. In and around the capital Abidjan alone, Caritas is helping more than 20,000 displaced people, most of them women and children. In February, Caritas Internationalis launched an appeal for €300,000 to support the emergency response. The different religious communities are currently providing shelter to roughly 25,000 displaced people. A lot of the aid from Caritas and partner organisations is also distributed through local Caritas offices in parishes. The situation in neighbouring Liberia, one of the poorest countries in the world, is getting critical as well. Many Ivorians arrive there exhausted after walking hours or even days with very little food. The new arrivals have been welcomed in Liberia, and most have been taken in by local families. But the sheer number of refugees is placing an enormous strain on already limited supplies of food and water. Ann, a widow in her late fifties, lives in the village of Glarlay in Liberia. She knows what it’s like to be a refugee, because she was made homeless during Liberia’s civil war. 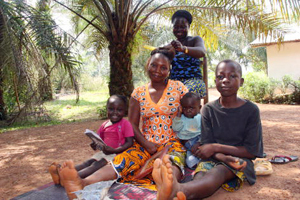 Back then, she stayed with Kasong, Suwopaing and their two children in Côte d’Ivoire. Now she is returning the favour. They recently crossed the border from Côte d’Ivoire to escape the violence, and Ann is doing everything she can to help them. “One good turn deserves another,” she says. Caritas staff are on the ground in Liberia to respond to the emergency. It is providing food, seeds and other essentials, such as mattresses, blankets, pots and pans, as well as building latrines that will prevent the spread of disease. Projects protecting children and other vulnerable populations will be supported as well.